Score a touchdown on Game Day with our Big Game Party Triplet gift set. Includes one 9 oz. can of our Tailgate Snack Mix, a 10 oz. 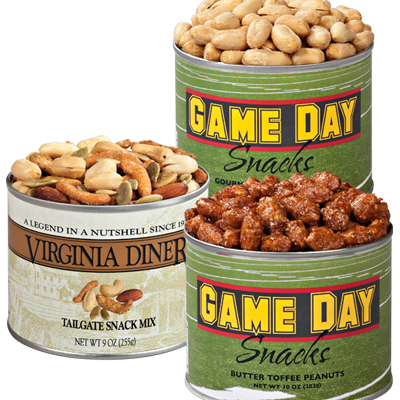 can each in our NEW Game Day label of Salted Virginia Peanuts and a 10 oz. can of Butter Toasted Peanuts. You say toffee, we say toasted. 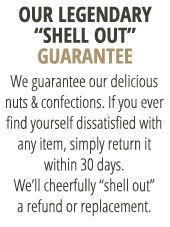 The same great item with the same great buttery, sweet crunch! VA Diner is the Best place for Virginia peanuts! I am a native Virginian! Whenever I need or am craving salty and crunchy peanuts, VA Diner is my destination for those goodies! The customer service abs quality at VA diner can't be beat! Gave some as a gift. Much appreciated. Our own cans are quickly dusappearing. Everything I order from Virginia Diner is great. Ease of shopping on-line and timely delivery are two of the things that make me a repeat customer. Thanks Virginia Diner! Good product, but two cans were dented, still sealed but dented. Also, not impressed with the labeling (VMI/UMD). One of the dented cans was the VMI can. Owner Response: So sorry one of your tins arrived dented. We will be in touch to correct this.